The white stuff we know as sugar is sucrose, a molecule composed of 12 atoms of carbon, 22 atoms of hydrogen, and 11 atoms of oxygen (C12H22O11). Like all compounds made from these three elements, sugar is a carbohydrate. Its found naturally in most plants, but especially in sugarcane and sugar beetshence their names. Sucrose is actually two simpler sugars stuck together: fructose and glucose. In recipes, a little bit of acid (for example, some lemon juice or cream of tartar) will cause sucrose to break down into these two components. If you look closely at dry sugar, youll notice it comes in little cubelike shapes. These are sugar crystals, orderly arrangements of sucrose molecules. Under a microscope, you can see that sugar crystals arent cubes, exactly, but oblong and slanted at both ends. What happens when you heat a sugar solution? When you add sugar to water, the sugar crystals dissolve and the sugar goes into solution. But you cant dissolve an infinite amount of sugar into a fixed volume of water. When as much sugar has been dissolved into a solution as possible, the solution is said to be saturated. The saturation point is different at different temperatures. The higher the temperature, the more sugar that can be held in solution. Why are crystals undesirable in some candy recipesand how do you stop them from forming? The fact that sugar solidifies into crystals is extremely important in candy making. There are basically two categories of candies - crystalline (candies which contain crystals in their finished form, such as fudge and fondant), and noncrystalline, or amorphous (candies which do not contain crystals, such as lollipops, taffy, and caramels). 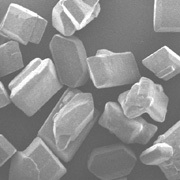 Recipe ingredients and procedures for noncrystalline candies are specifically designed to prevent the formation of sugar crystals, because they give the resulting candy a grainy texture. One way to prevent the crystallization of sucrose in candy is to make sure that there are other types of sugarusually, fructose and glucoseto get in the way. Large crystals of sucrose have a harder time forming when molecules of fructose and glucose are around. Crystals form something like Legos locking together, except that instead of Lego pieces, there are molecules. If some of the molecules are a different size and shape, they wont fit together, and a crystal doesnt form. A simple way to get other types of sugar into the mix is to "invert" the sucrose (the basic white sugar you know well) by adding an acid to the recipe. Acids such as lemon juice or cream of tartar cause sucrose to break up (or invert) into its two simpler components, fructose and glucose. Another way is to add a nonsucrose sugar, such as corn syrup, which is mainly glucose. Some lollipop recipes use as much as 50% corn syrup; this is to prevent sugar crystals from ruining the texture. Fats in candy serve a similar purpose. Fatty ingredients such as butter help interfere with crystallizationagain, by getting in the way of the sucrose molecules that are trying to lock togeter into crystals. Toffee owes its smooth texture and easy breakability to an absence of sugar crystals, thanks to a large amount of butter in the mix.